The styled tagline can work well with the Boundless W or the Boundless band. 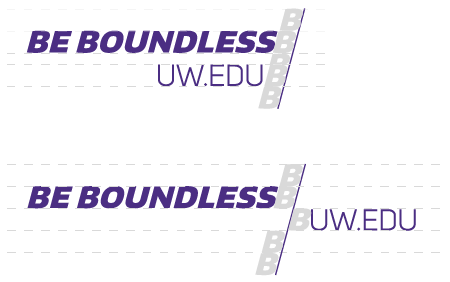 The Boundless tagline can stand alone or be used in partnership with a 15-degree angled line. The line echos the forward movement and is a simplistic representation of the edge of the Block W logo. It can also include a URL that connects to the university home page, or your college home page. No downloads are available for this. Simply use the styled tagline + angled line, and using a brand font, add your custom url as text. A clear area equivalent to the B must be preserved around the complete tagline. Elements such as type or images (excluding a background treatment) may not encroach on the clear area. The length of the 15-degree angled line is determined by whether it bleeds off the top of the page, the bottom of the page or doesn’t bleed at all.